Ambassador of India H.E. 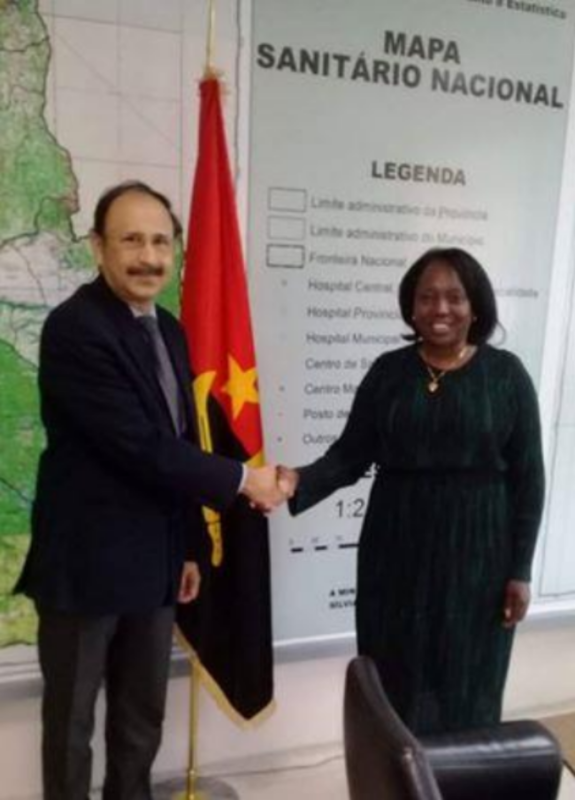 Mr. Srikumar Menon met Her Excellency (Dr.) Silvia Lutucuta, Angolan Minister of Health on 10 January 2019 at MINSA. Discussions focused on bilateral cooperation in specific areas of healthcare and medicine (as identified during her July 2018 visit to India), besides early finalisation of MoU in this regard. They also explored scope for investments by Indian hospitals and medical entities in the Angolan healthcare and pharmaceutical sector; cooperation between the Angolan Ministry of Health (MINSA) and top Indian Hospitals - involved in primary care, diagnostics, specialist care, telemedicine, as well as with academic & research institutions.